Viña del Mar is one of the most tourist cities in Chile. Because of its proximity to Santiago, it is only 120 kilometres away by car. It is visited throughout the year by thousands of tourists, both Chilean and foreign. With Valparaiso they form an important tourist pole, where they mix good beaches, night entertainment, sporting activities and culture. 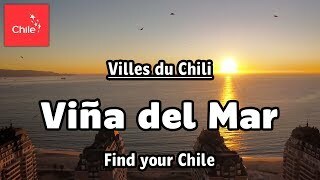 Viña del Mar is one of the most important tourist cities in Chile. Being only 120 kms away from Santiago, it is one of the favourite destinations for Santiaguinos but also for foreign tourists. Along with Valparaíso, these two cities make up an important tourist pole, with excellent beaches, a lively nightlife, sport activities, and culture. Viña del Mar is located 213 kms away from Los Libertadores Border Crossing, on the border with Argentina. Because of this, the city's main tourist activity is to satisfy Chilean and Argentinean tourists by offering all the services and comforts possible, including 5 star hotels, hostels, tours, a varied gastronomic offer, bars, and discotheques. Viña's city center was built around José Francisco Vergara square and the famous Valparaíso street. Its beautiful, 4 km promenade goes from Caleta Abarca to Ochoa. Along the avenue you can see majestic buildings, such as Club Árabe and Wülff Castle, with a traditional medieval style. After crossing Marga Marga stream you will get to Perú Avenue, a street with nice cafés and restaurants overlooking the shore. Further up north you will find Acapulco and Sol beaches, located close to Muelle Vergara (Vergara Pier), once used for shipping coal and sugar, but now remodelled to become a tourist spot. The coastal park and Sport Beach have several alternatives for family entertainment, with soccer and volleyball fields, and skateboard ramps. Along the shore you will also find San Martín Boulevard, with attractios such as a craft market and a children's playground. In the surroundings you can also enjoy Reñaca beach, the most attractive in the area, with a variety of summer activities. Viña del Mar is much more than just sea and beaches. The city is filled with castles and palaces built in the early XXth century, a lot of which have now become cultural centers, such Palacio Vergara (fine arts museum), Carrasco Palace (the municipality's cultural center), and Wülf Castle, (patrimony center). Also, palaces like Rioja are open to public. Other places worth visiting are Teatro Municipal (a national monument), the casino, and Francisco Fonck Archaeology and Natural History Museum, which has pre-Columbian works in silver and pottery, and a rich collection about Easter Island, including a Moai brought directly from the island. Regarding outdoor spaces, Quinta Vergara Amphitheater boasts exotic plants brought from the Asia and Australia by its owner, Dolores Pérez de Arce. This is the place where Festival de la Canción de Viña del Mar. Sausalito Lagoon, an old reservoir owned by the Vergara family, is a tourist complex wher you can enjoy boat rides, water ski, or complementary activities in its tennis courts and pools. Finally, there is the Botanical Garden, with over three thousand different species of vegetals, and the popular flower clock, inaugurated in 1962, the same day the Soccer World Cup during started in our country. Taking a photo of yourself with the clock in the background is a must. The gastronomy in the central zone of Chile, there is a wide choice of dishes throughout the year, you can't go in chile without having tasted the traditional Chilean empanadas or without having tasted a good vinochileno. The charquicán, casserole or the sopaipillas with pebre to spend the cold winter or preparations made from corn such as pastel de choclo and the tamales that are characteristic of summer. Also you can refresh with a good motto with huesillo peach and mote. You can also find a variety of fish and shellfish that are located along the Chilean coast. Stew of conger eel, clams with Parmesan cheese, shrimp empanadas and oysters Pil pil are just some of the dishes more characteristic and favourite of the country. Bus: From Santiago to Viña del Mar. Tour: From Santiago to Viña del Mar. The climate in the V Region is chilly and Mediterranean with dry summers and humid and temperate winters. The average annual temperature is 15° C. During winter the temperature is around 11°, and during summer the temperatures surpass 25 ° C.
Do not litter on beaches, parks, or streets. Taking care of our environment is everyone's responsibility. Avoid fines by following the rules. Here are the must-see vineyards in the Casablanca Valley to enjoy good wine, tremendous gastronomy and a visit to its vineyards. Find out what are the best options in Chile to receive the new year with the best energies. Valparaiso and Viña del Mar: What to do?